Well folks, in the continuing whirlwind of my life…I moved to NYC this week! Long story short, due to budget cuts my contract ended about a month earlier than expected or desired (by anyone, my team or myself). The higherups had been waffling between an end date in December and one in January and, despite the fact that I was pulling awesome numbers and everyone loved me <–sorry not sorry I’m bragging because its true! they had to let me go. Three months ago this would have fueled a complete and total meltdown. This time, I hustled. No seriously. I found out last Tuesday and decided right then and there that my trip home for Christmas would actually be my move to the city. *gulp* Everything sped up drastically. All those things I thought I had weeks to do–farewells to friends, final appointments with my physical therapists and my treatment team, last Zumba classes and support groups, crossing stuff off my Baltimore Bucket List, etc–got done in a matter of days. Or were scheduled for my return trip in a few weeks to a) pick up the increasing number of things I forgot (the perils of packing super quickly) and b) actually get in some of those “last time” things. In a matter of days I went through the grief process- shock/denial/anger, sorrow, acceptance, and excitement. Even though it was last minute, it was still mostly on my terms. I left Baltimore feeling overwhelmed with love and appreciation. I left at the end of the year and the school semester (for my Zumba classes), rather than at an awkward mid-point. Because most of ‘my people’ had left already, the list of people I really absolutely needed to see was rather small. And my last two days were spent killing it at work, the staff Holiday party, and packing with one of my best friends. I couldn’t ask for anything more. Through it all, I did my best to take the time to really savor and enjoy it. I didn’t really have a choice! I was overwhelmed and stressed but I also focused on the moments of beauty and all the things I could be grateful for. And then I stuffed my car to the hilt and partook in that everyone’s-gotta-do-it-once experiencing of driving hundreds of miles with (almost) all of your belongings to start anew somewhere else. And now…here I am. Finding my way around this giant city. We’re still living out of boxes, although this weekend’s Ikea trip should solve that thank-you-storage-solutions. I’ve already found a tailor, a support group, and a new friend! Not bad considering I’ve only really been in town for 3 days! Honestly though, I’m still waiting for it to truly and deeply sink in that I’m here. Kate (the new friend) told me to have patience. So that’s what I’m going to do…along with letting myself revel in every bit of joy over this experience (seriously, if you see me I probably have the biggest , goofiest grin on my face). There’s still a lot of unknowns but at least we’ve settled on a location for now. The beau is working steadily and I’m making my way, one day at a time. Fuzzy but look how effing cute it is! Well folks, it’s official. The beau and I are officially the latest residents of NYC (though I’m not living there yet)! I’m beyond obsessed with our adorable studio. 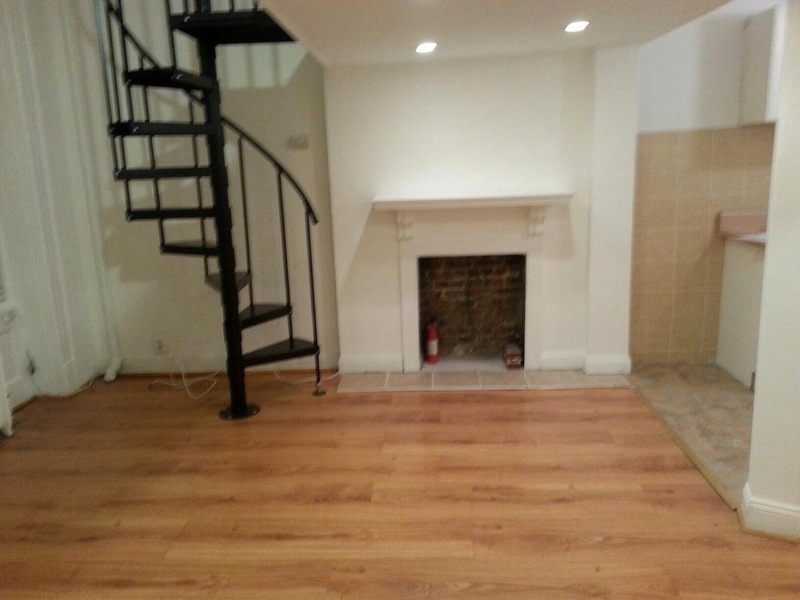 I mean, we have a fireplace and a spiral staircase. No dishwasher or laundry *gulps* but right now, I don’t care (I love it)! The beau is moving in immediately and I’ll follow as soon as my work here is done (date still TBD). Right now I’m in the process of finding new doctors and a new gym to teach at. But mostly I’m in complete and utter awe that this dream, the one we never dared think possible…this impossible, beautiful dream…is coming true. I don’t think it’s a coincidence that I keep hearing “New York State of Mind” on the radio. All the time…like it was just release. And you can bet your behind that I sing along at the top of my lungs, each and every time. In addition to that, we’re still recovering, financially and otherwise, from the brutal months of job hunting. For now though I’m excited and grateful and a million other invigorating emotions because guys…it’s my favorite city. And I really can’t wait to show it to you.